All of this bring us back to Snowden’s quote above, and the question he throws open for us. How do you know that an RNG is working? What kind of tests can we run on our code to avoid flaws ranging from the idiotic to the highly malicious? Unfortunately this question does not have an easy answer. In the rest of this post I’m going to try to explain why. It’s important to note that pseudorandom number generators aren’t “random number generators” at all. These generators typically use cryptographic algorithms (e.g., block ciphers or hash functions) to process a seed value from the RNG into many apparently random looking and unpredictable bytes. In other words, with only a few ugly glitches — things that can happen in real life — you can easily get a broken random number generator that nobody notices until it’s way too late. And that’s without deliberate tampering, which makes things way, way worse. The nature of these tests varies. Some look at simple factors like bias (the number of 1s and 0s) while others look for more sophisticated features such as the distribution of numbers when mapped into 3-D space. Now I don’t want to knock these tests. They’re a perfectly valid way to detect serious flaws in a (true) RNG — I can attest to this, since I’ve built one that failed the tests miserably — but they probably won’t detect flaws in your system. That’s because like I said above, most deployed systems include a combination of RNG and PRNG, or even RNG plus “conditioning” via cryptographic hash functions or ciphers. The nature of these cryptographic, algorithmic processes is such that virtually every processed output will pass statistical tests with flying colors — even if the PRNG is initialized with ‘garbage’ input. This means, unfortunately, that it can be very hard to use statistical tests to detect a broken RNG unless you properly test it only at the low level. And even there you won’t rule out intentional backdoors — as I’ll discuss in a moment. Assuming that you’ve tested your true RNG properly and it’s passing all tests, it’s still important to test your PRNG. One approach to doing this is to use Known Answer Tests (KATs) that are essentially test vectors. These contain some input seed material as well as a set of output bytes that should be the algorithmic result of running the PRNG on that seed. Since PRNGs are purely algorithmic, the theory here is that you can test them like algorithms. While this approach is valid, it raises two potential issues (both of which I’ve seen in practice). First, you can only test your PRNG on so many points. Thus it’s quite possible that your PRNG will succeed on one particular test vector (i.e., it’ll output just so many valid bytes) but go completely off the reservation on some other input. This is unlikely, but not impossible in normal conditions. It’s very possible if someone is trying to build a malicious backdoor into your PRNG implementation. Second, the process of instrumenting your PRNG implementation for testing can actually introduce vulnerabilities in your deployed system! Think about this for a second. Normal PRNGs take in real random seeds from your RNG. The last thing you’d ever want to do is run your PRNG on some predictable seed — if you did, everyone would be able to predict the PRNGs outputs. Yet adding a test harness your system means building in logic to re-seed your RNG to something predictable! This is like adding an ejection seat to your car. Might make you safer — unless it goes off while you’re driving to work. A quick glance through e.g., the OpenSSL code shows that indeed, exactly this sort of code exists and ships in some versions of the library. Of course, the experienced developers will note that surely such features could be surrounded by pre-processor directives (or the equivalent in your language of choice) ensuring that they’ll never be activated in production code. Sadly, at least in the case of FIPS, this is not possible — for reasons I’ll explain next. Which brings us to the $10 million question. What happens if an attacker is deliberately tampering with our RNG/PRNG in order to make it fail? Note that this is not an academic question. We have excellent reason to believe it’s happened in some real systems. ** The original version of this post claimed that /dev/random seeds /dev/urandom. This is actually a mistake — both /dev/random and /dev/urandom use the same PRNG, but /dev/random simply keeps track of how much ‘entropy’ is in the pool and blocks when you have drawn too many bits. Thanks to Brendan Long and Thomas Ptacek for setting me straight. Actually, the Linux kernel always creates random numbers the same way for both /dev/urandom and /dev/random (although their entropy pools are kept separate). The only difference is that /dev/urandom will stop giving you output if the “entropy” is too low. For crypto this sounds like a serious problem. But what about for randomized algorithms like Miller-Rabin primality. Is the fact that the random numbers they are using aren't quite random a problem or not? I want to say they don't seem to be since the Miller-Rabin primality test works in the real world- but do we really know that? Ups. I learned it to do by XORing. *looks in HoAC*, ah. Interesting. But why? Can you please suggest something to read why I shouldn't use XOR? Let's say I can control the output of the RNG. That is, I have a backdoor in your system that allows me to specify /any/ set of 'random' bits in response to a low-level RNG call, and I know the bits Y you're going to XOR my response with. Then I can choose a value X such that X xor Y = Z for any chosen Z. This is a pretty rarified, ridiculous attack — but it's conceivably possible to engineer it if you have enough access. It's much harder to do this if the combination step is Z = H(X || Y). I'm not sure of a good citation, but if the procedure for mixing the entropy pool is too simple (and particularly if it is a linear operation in some Galois field or otherwise commutes with XOR) then a simple relationship exists between the added entropy and the resulting entropy pool state. This means that some common accidental relationships between added entropy values may actually remove entropy, and furthermore it may be easier for an attacker to manipulate entropy pool state. 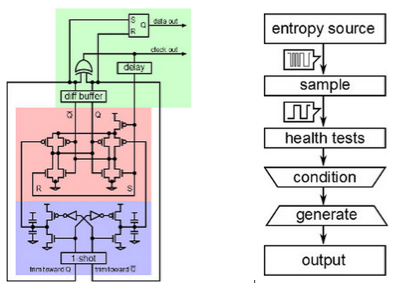 In the simplest case, if the entropy pool mixing operation is the identity function, if two inputs are successive values from a 128-bit counter, 50% of the time the net effect is to flip the least significant bit, 25% of the time the two least significant bits of the pool are flipped etc., which works out to 2 bits of actual entropy added, regardless of the amount of entropy present in the 128-bit counter. At a bare minimum, a strong avalanche effect is desirable. Flipping one bit in your input should flip about half of the bits in your entropy pool. In the case of the Linux /dev/random, I seem to remember the entropy pool mixing operation is a lagged fibonacci generator (hopefully using addition instead of XOR, but I don't recall). Note that Keccak (SHA-3) uses a simple XOR to mix blocks of entropy into the entropy pool, but uses a very strong mixing function. So, if the mixing function is very carefully constructed for proper linear and differential, etc. properties, XOR isn't a problem. However, it takes several person-years of expert analysis to determine that a mixing function is *probably* okay with XOR. A hash function that's believed to be secure does, however, give you the properties you want: strong avalanche, good linear properties, good differential properties, etc. to make it as difficult as possible to deduce the entropy pool state from its outputs or to be able to deduce how to force the entropy pool into a state where new entropy is poorly mixed. In the end, maybe you can come up with your own function that has all of the needed properties, but many expert person-years went into making SHA-2 and SHA-3 achieve the needed properties in a minimum number of CPU cycles. Maybe it's possible you could roll your own function that had the needed properties, but it's very unlikely it would run as fast as SHA-2 or SHA-3. If your own function runs faster than SHA-2 or SHA-3, it's almost certainly missing something. Thank you, I think to get it now. I appreciate the RNG article. The point of modifying the state of the DRBG should definitely be consider by all designers. Of course this is true with any DRBG/PRNG not just SP800-90. 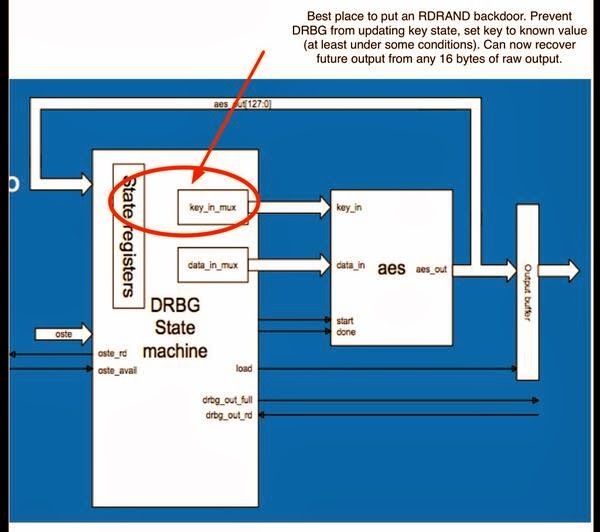 If the DRBG is hardware only then it's straightforward to disallow any modification of the key when not in test mode. For ASIC and FPGA designers requiring the best security, use a hardware only SP800-90 AES 256 CTR-DRBG with prediction resistance always enabled. If used the only attack I can think of that may work is a fault injection attack against the AES or somehow locking the TRNG entropy. Both attacks should be detected by health monitor and simple anti-tamper. Of course the main security problem isn't that there aren't good solutions. It's that many commercial companies business units don't care enough about security, understand security, or want to pay for high quality solutions. About /dev/random and /dev/uranom using yarrow: you were thinking of FreeBSD's versions (which are identical). Pondering again the question of XOR vs Hash for mixing: Shall we see mixing functions as distinct cryptographic primitive? 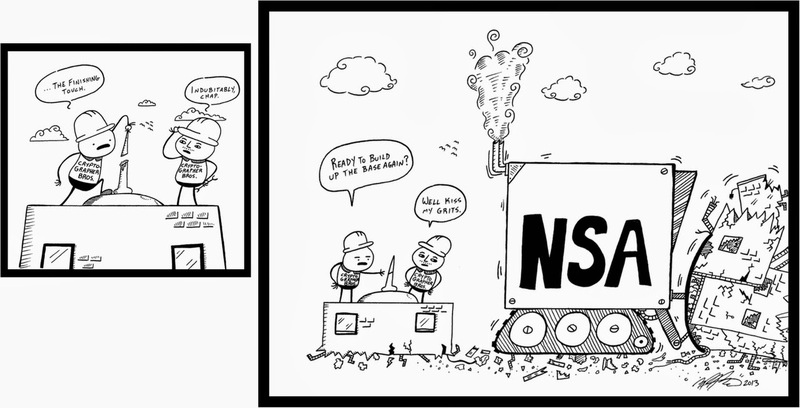 The only thing that you and so many others seem to forget is that NIST/NSA has final say and oversight over encryption. If someone published an encryption algorithm and set it free to be downloaded and used by anybody, then that individual or group would be charged with aiding the enemy; which carries with it the possibility of execution. As has been evident with the Snowden revelations the NSA has manipulated encryption to allow themselves an easier time at decrypting the encrypted information. Also, there is a 256 bit limit to consumer grade encryption; anything grater than that and it would be illegal to just hand out. Encryption is not permitted to prevent the US government from being able to decrypt the information. Encryption is only used to try and prevent other people from easily decrypting the encrypted information. Both Blowfish and Threefish can have keys >= 256 bits (448 & 1024 respectively.) Algorithms can also be stacked, although not with linear security gains (or any in some cases). You can also always kick it old school with a one time pad, although that has its own, seperate problems. I'd be much more concerned about someone (NSA or otherwise) with a big pipe and few moral constraints than the algorithmic security of block ciphers though. If I understand this correctly, the weakness of XORing is when the attacker has control over one entropy stream and can read the other (let’s assume just two streams to make it simple). Then the attacker can control the output of the RNG. However, if the attacker has access to each of the entropy streams, presumably he can compute the output of the RNG regardless of whether a hash or XOR is used. The only benefit of the hash is the attacker cannot necessarily _control_ the output, but he would still be able to read it just fine. As far as I can think, the only time this would make a difference is in a (seemingly) contrived situation where the attacker has compromised the system enough to have an entropy stream that can see all the other entropy streams, and actively works against them, but not compromised enough for the attacker to know what’s going on once this has started. On the other hand, XORing the streams _guarantees_ entropy as good or better than the stream with the most entropy — that is, XORing will never make things less random, and all you need is one good independent stream at a time to be working right for the whole system to stay secure. I’m unaware of the same guarantee with any hash function, but I’m very interested if they exist. If you don’t have that guarantee, you’re right back to the primary topic of this article: even if a hash function seems pretty good and passes the statistical tests, you can never be sure if it might just be making things less random and wasting all the work of your entropy pools. One advantage of using a hash function is that it spreads entropy over all input bits. But it is also true that a bad hash algorithm can make things less random. While A xor B will be at least as random as the most random of A and B. I guess taking all these things into consideration is part of designing a good crypto system.